1890's Cryptid: Was A Mothman Captured in Quebec, Canada? By Jon Wyatt - Did a young farmer kill a Mothman near a Quebec village in about 1892? The evidence is intriguing. Sainte-Emelie-de-l'Energie (pop. About 1600) is a French speaking village located 119 kms (74 mi) north of Montreal, Canada-- at the intersection of Routes 131 and 347. It's in a valley and the nearby hills - lair of the monster - are covered by a mixed forest of sugar maple, yellow birch and white birch trees. According to 1891 census records M. Medard Lassalle or Lasalle, 52, was married, residing in the district and the father of 10 children. Joseph Lasalle, the fifth child, was born in 1870 and was aged about 23 – not 35 - when he allegedly shot the flying monster. Joseph married Louise Gadourey at Sainte-Emelie-de-l'Energie in 1895 and the couple were raising three children in 1901. 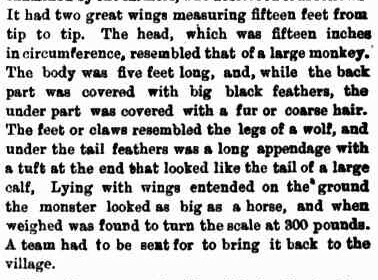 “The story of the capture of the bird-beast and the description is as a follows. For two weeks past the farmers of Ste Emelie de l'Energie and neighbouring villages have suffered from the depredation of some beast of prey, who nightly visited their sheepfolds and carried off some of their finest lambs. It was generally supposed that a bear was in the neighbourhood, and the farmers have been on the alert for the capture of his bearship. “On Wednesday of last week, Joseph Lassalle, a big young fellow of 35 years, went in search of the supposed bear, armed with a double-barrelled rifle. Some five miles [8 kms] back in the wood from the village named he was startled by hearing a loud croaking cry, and looking upward he saw, circling high up in the air, an immense creature that he at first to be a monster eagle. “The bird, or whatever it was, was rapidly descending, and Lassalle, who is a crack marksman, took careful aim and fired. The monster was struck and badly wounded by the heavy rifle bullet, and, screaming with pain and rage, it came tumbling to the earth. As it landed he gave it the other barrel of the rifle, and still thinking it was an eagle, rushed on with his clubbed gun. “A terrible battle ensued, lasting for several moments; then the victory was with the man, and the monster lay dead at this feet. He had now time for a closer inspection of his game, but the thing presented such an awful and unnatural appearance that he was terror-stricken and ran back to the village for help. Well, what was it? If it wasn't a giant bird perhaps it was a monstrous bat. Well mega bats aka fruit bats and flying foxes are not found in North or South America and the largest specimens, found in Australia and the Philippines, weigh-in at a few pounds. We may well ask, was it a Mothman? “This was seen by Mr Alder Charland, a councillor of the town of Joliette, who was going through the country purchasing produce. He bought the monster probably for exhibition purposes from the Lassalles, and Friday evening last it was brought by train to his place of business in Joliette, where it in now in process of preparation to prevent decay, after which it will be shipped to Montreal for scientific examination. “Those who claim to have seen the monster say it is the most extraordinary sight they ever witnessed, and it is hardly possible that all the respectable men who tell this story about it can be lying, and, if not, what can the monster be that is at present causing such a sensation at the Joliette district of the province?” Source: Maitland Mercury, NSW, Australia, 14 February 1893. So what happened to the alleged flying monster? well, that is the $64,000 question. If M. Charland took it to Montreal for examination it may well have disappeared into the vaults of the scientific establishment to be never seen again.